We've been dusting off the Creative Archives in my house -- it's also known as I wonder what's in this old box. The moment I open the lid, out wafts remnants of past creative pursuits... and memories of warm summer days long ago when out we went armed with a box of paints, a couple of brushes, and a picnic lunch. 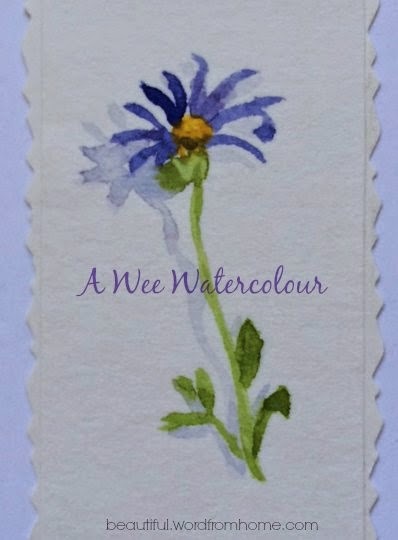 Not to mention a wee little dream that maybe we'd get famous one day with our 'almost like Monet' attempts at painting flowers from the garden. (Smile) We didn't really think that... well, not too much anyway. And, yes, that's me above dabbling away at that lilac piece. It's a long time ago since that summer afternoon. 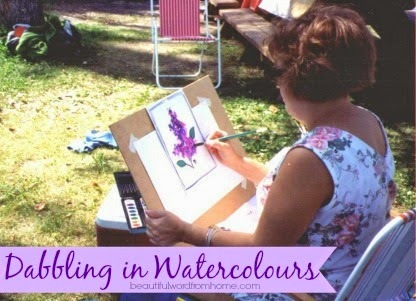 How I remember the happy fun of sitting in the dappled light playing with that delightful shade of purple lilac. The full version of the pansy posy above. 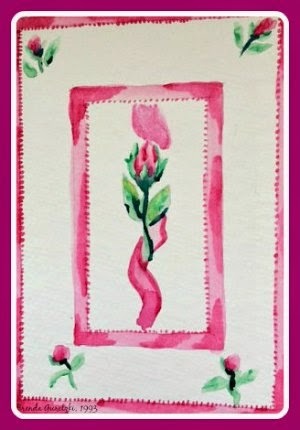 My best friend and I took our very first water colour class one spring a long time ago... from a fellow named Frank Haddock who is now a well-established watercolourist in our area of the world. from a pretty piece of stationery. Taking the class was my first real attempt at painting. As we practiced our brush strokes and learned colour depths, our instructor used to regale us with tales of his well-loved cats (which we thought purr-fectly lovely), thus keeping us entertained as we'd twist our tongues in attempt to get used to holding a brush. my attempt to create shadow turned out here. As life took unexpected turns, and for some years there was little room or energy left for what Sir Winston called 'joy rides in a paintbox'. In truth at that point, I tended to feel more creatively comfortable with a pen than a paintbrush -- I hadn't yet practiced long enough for it to feel 'at home' in the crook of my hand. We're not sighing here... there are seasons for everything. And, I guess, at the back of my mind, I've kinda hoped there might be a time down the road to pick up those paints and brushes again. Not to get 'famous' this time, but just to enjoy playing with colours on paper, trying to capture a little of the beauty in nature's garden, and to have just plain ole fun in the process. Ever since I took photos of flowers in that macro up-close style some years ago, I've had a hankering to try painting something in the Georgia O'Keefe way. And I love teeny tiny wisps of paintings too. 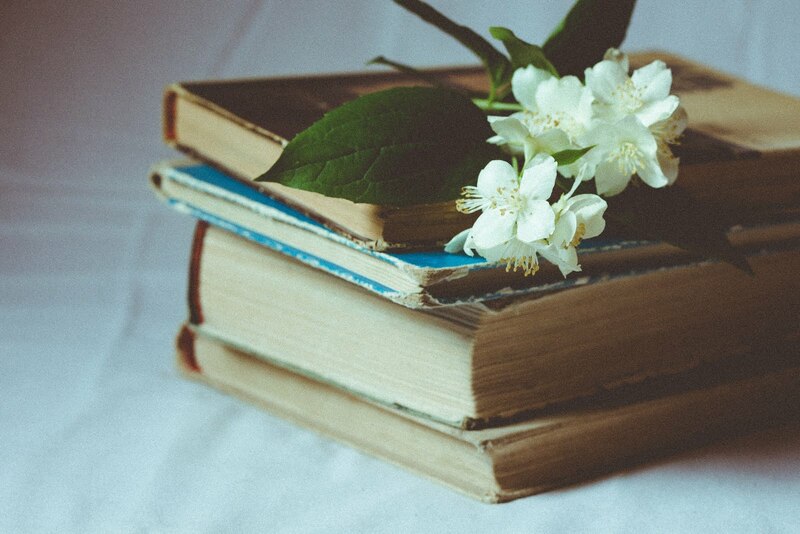 Who knows, perhaps my poking around in the 'archives' has unleashed something old but new... for as surely as Spring gets ready to burst out her catkins and green budding nubs, we ourselves feel about to burst out with new energy and joy for something new this season. Now, where are my paints and brushes? 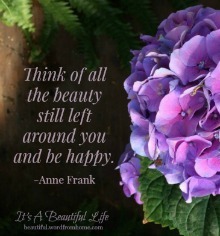 Here's wishing you a beautiful day and a wonderful week ahead. I love everything about that photo of you painting. The colors all go together, outside in the sunshine, you wearing a summer dress with bangles, sitting up so straight and painting, wow! What a tranquil moment. You can almost hear the birds singing. Oh, go for another "joy ride in your paintbox"! This is a beautiful post - Your watercolors are also very beautiful!!!! I love that you included the quote by Churchill. Praying that I take the pressure off myself and go on more joy rides in a paintbox. That is so much easier and more fun, more relaxing than trying to be the next Georgia O'Keefe. Thank your for this lovely post! Accckkk thank YOU not YOUR - hate those typos! Oh how lovely, Brenda. I hope that you will return to some joy riding in your paintbox. The expression "a joy ride in your paintbox" is a lovely thing. I do hope you pursue more painting. It can be fun to dabble in something different! Your pansies are sweet and lovely. 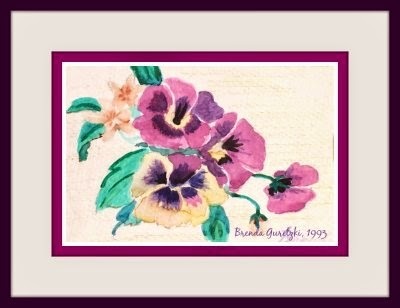 Brenda, I really enjoyed your water color pictures. 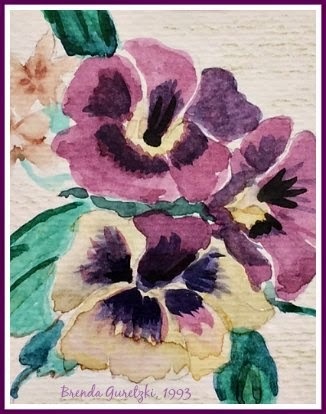 I'm not usually much of a fan of water color, but it works great in the pansy pictures especially. So happy that you enjoy artistry. Very pretty photos of your paintings!! A joy ride in a paint box....what a lovely description! I love that photo of you Brenda....Your paintings are really good as well. there is still time I guess...:) the quote is excellent too. Could this also be applied to writing? You have a gift, Brenda! You should keep at it, these are truly lovely paintings. Susan Branch on her Facebook page asked her readers what made them smile today. Just thinking about it, I had several things come to mind, including all your beautiful comments -- they made me smile on the inside and the outside. You are all so kind and lovely. Thank you for speaking into my life. How lovely! I hope this brings you as much joy as it did me to look at your work. 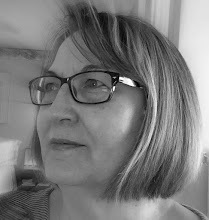 I've often thought of myself in my golden years walking the hills in southern France with an easel and box of paints.